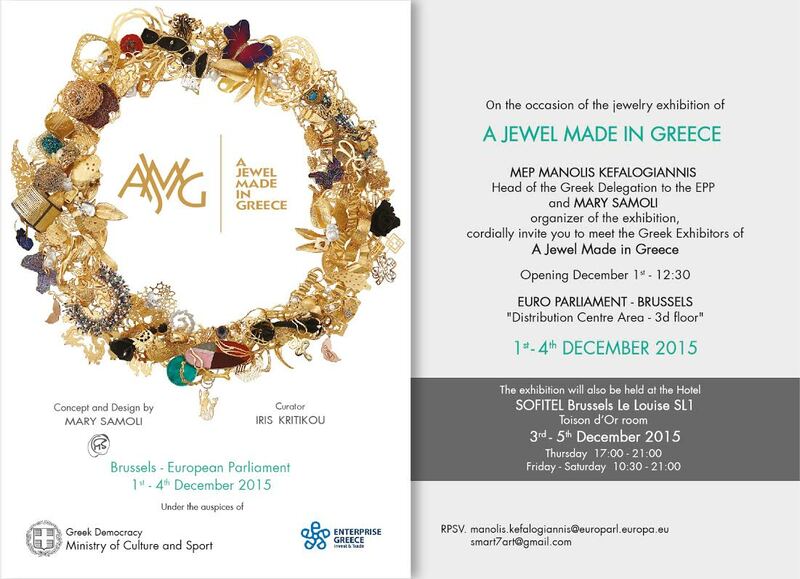 The platform "A JEWEL MADE IN GREECE" continues for the third consecutive year the creative journey with a stopover in Brussels, hosted by the European Parliament. Three years ago, with starting point Technopolis - City of Athens, the idea of ​​the jewelry designer Mary Samolis was realized with the creation of a flexible and elegant platform that hosts Greek designers-creators of contemporary jewelry, presenting at the same time the history of the Greek jewelry by cooperating with the most important Greek museums. During the first exhibition which took place, more than 7,000 visitors came into contact with an impressive mosaic of the Greek culture and contemporary art. The curator of the platform and of the ongoing activities taking place in Greece and abroad is the art critic Iris Kritikou. During a period when Greek culture is the most important asset of the promotion and development of our country, "A JEWEL MADE IN GREECE" opens its wings and travels to Brussels, after receiving an invitation of the Member of European Parliament Manolis Kefalogiannis to present -in the heart of Europe, in the Building of the European Parliament, (Distribution Center Area 3D)- creations by Greek jewelry designers with a strong element of the Greek culture and contemporary approach. The message is clear: the Greek jewelry has a long history and a strong identity and it can conquer a prominent position on the world map of the art of jewelry. The exhibition AJMIG will be held at the European Parliament in the period from 1 to December 4 while at the same time it will be accommodated in SOFITEL BRUSSELS - Toison d'Or Hall, from December 3 to December 5, 2015. Maria Kaprili, Tina Karageorgi, Voula Karabatzaki,Panos Kardasis, Mara Kartali, Apostolos Kleitsiotis, Maria Kontogiorgaki, Katerina Kouloubourou ,Fotini Kostouli, Dolly Boukoyianni, Eleni Orfanou, Daphne Papathanasopoulou, Michalis Pelamidis, Amalia Petsali, Marilou Prokopiou, Mary Samoli, Polina Sapouna Ellis.